Just as the L-NOW D760, the D525 model is part of the new “pooboo” series. The pooboo D525 offers a greater weight capacity and a slightly heavier flywheel, though. It’s a sturdy trainer, great for anyone who wants to perform spin workouts at home. 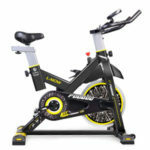 It’s also one of the highest rated indoor cycling bikes from L-NOW so far. The L-NOW pooboo D525 features a triangular frame made of thick steel tubing. It combines ovalized and rectangular tubes in its construction for improved aesthetics and sturdiness. It’s definitely an indoor cycling bike made for spin workouts and offers a weight capacity of 330 lbs (150 kg), which is not bad for a non-commercial unit. The bike’s construction also integrates several ABS parts. However, these only have a protective or cosmetic role; they don’t reduce the unit’s sturdiness in any way. Among them, we can count the drive belt cover, the end caps of the base bars and the cover of the brake pad. The bike’s main frame features a black powder coating resistant to corrosion, with the L-NOW logo painted yellow, and the “pooboo” series name painted white. The rear base of the bike also has a yellow paint finish. The seat post and the handlebar post feature a gray paint finish. These are the only colors available for the D525 model. This L-NOW exercise bike is not extremely large. With the frame fully setup, it is approx. 44″ (111 cm) and 21.6″ (55 cm) wide. It is recommended, though, to leave at least two feet of clearance all around it for safe usage and ease of access. Also, in case you’re wondering, this exercise bike does not fold. Given the fact that it only has a flywheel of 25 lbs (11.3 kg), this bike is a bit lighter than other models. It weighs approx. 75 lbs (34 kg). For example, the L-NOW Pro C580 weighs over 100 lbs. But nonetheless, 75 lbs is twice the weight of the average road bike, and therefore, this exercise bike provides excellent stability. Its bases are also equipped with adjustable levelers. Once the bike is fully assembled, its relocation is done with ease. Its front base features a set of transport wheels, so by leaning the frame forward and using these wheels, you will only handle approx. 1/3 of its total weight. 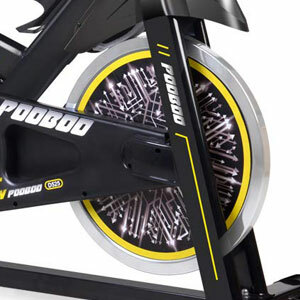 The pooboo D525 indoor cycling bike includes a standard saddle. It does not have air cushioning cells as other bike seats, but does integrate a layer of foam padding and has a contoured surface. On the other hand, it’s a medium-size seat and not a slim one like other spin bikes have. In other words, it’s a seat for optimal comfort. The saddle has a standard collar-type attachment system. Therefore, in case you want to replace it, compatible options should be available in any bike shop. Also, you can improve its comfort by attaching a gel cover on top of it, if needed. The seat is 4-way adjustable. Its horizontal slider offers several inches of front to back adjustment. Its upright post also has a few adjustment notches. These being said, the bike can accommodate users between 4’10” and 6’2″ (147 – 188 cm), promoting a full range of motion and a complete leg extension. As opposed to the seat, the bike’s handlebar only offers 2-way adjustability (up, down). Its upright post has several adjustment positions. The handlebar itself features a multi-grip design. It offers the possibility to adopt an aero grip, a race grip, or a standard grip. It has a center loop bar which can also be used for a close parallel grip if you remove the phone holder. This loop bar also serves as support for the bike’s fitness meter. The side handgrips of the handlebar are covered by a layer of high-density foam. They provide a comfortable and secure grip. They also integrate metallic pulse sensors. As we’ve mentioned above, the L-NOW pooboo D525 is equipped with a lighter flywheel than other bikes. It only weighs 25 lbs (11.3 kg). However, it has a perimeter-weighted design, so it can provide a pretty consistent inertia, so it’s an excellent bike for spin workouts. The flywheel is chrome-plated and has ABS side covers black/yellow in color like the rest of the bike. It is also bi-directional. This means you can pedal in reverse if you want, but since it’s an indoor cycling bike without a derailleur or a standard bike drive system, you cannot coast on it. When pedaling in reverse, you benefit from the same resistance as when pedaling forward. This can be a plus as you can diversify your workouts. This indoor cycling trainer is equipped with a friction resistance system. It has a felt brake pad situated above the flywheel and attached to the tension knob on the oblique frame tube. By turning the knob clockwise, the brake pad applies more friction to the flywheel which results in a higher pedaling difficulty. There are no tension levels specified on the knob. You simply tighten it until the bike delivers a satisfying resistance. You can basically tighten it up to the point you can barely pedal. The tension knob also functions as an emergency brake. You can press it down to stop the flywheel from spinning if needed. This may actually be necessary, as the pedals continue to spin for as long as the flywheel is spinning. The pooboo D525 is belt driven. It uses a poly-v belt resistant to stretching. This being said, you don’t have to worry about lubricating the bike’s transmission. It also delivers a very smooth and quiet pedaling motion. 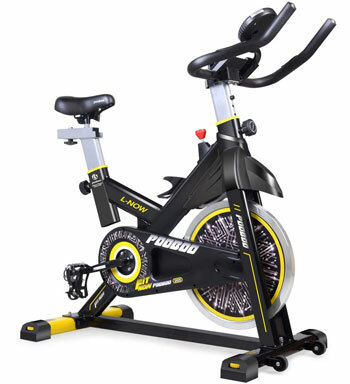 Last but not least, this L-NOW indoor cycling bike is equipped with a heavy-duty crank with solid steel crank arms. The pedals are also metallic, made of aluminum alloy. They don’t have SPD clips for spin shoes but do have adjustable toe cages in case you need to secure your feet in place during pedaling. 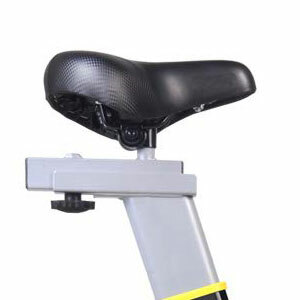 They are durable enough to support users up to 330 lbs (150 kg) even if they exercise while standing up on the pedals. 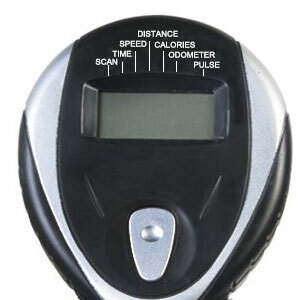 The included fitness meter is a basic model. It features an LCD display which tracks the main workout metrics including time, distance, speed, calories, and pulse. It also has an odometer function which shows the total distance traveled. The meter unit has a pulse reading function but it does not have an internal HR receiver. Therefore, it cannot read your pulse via an HR chest strap from Polar or ANT. In order to benefit from a pulse reading, you will have to use the integrated sensors. The meter is very easy to use. To begin with, it is battery powered, so you don’t need to connect it to a wall socket. It only has one button which toggles ON/OFF the unit’s SCAN function. With the SCAN function set ON, the workout metrics are shown in a sequence, each one appearing on the display for a few seconds. By pressing the button, you can toggle the SCAN mode OFF, and select one of the values that interests you the most to be shown on the display at all time. Also, by pressing and holding the button down for a few seconds will reset all the values to zero. The meter starts up when you begin pedaling or when you press the button. It also has a battery save mode, to which will enter if it doesn’t detect any activity on the bike for more than 4 minutes. The bike’s flywheel, crankset, belt, belt cover, and resistance pad are already assembled. Therefore, you only need to attach the base bars, the seat post, the handlebar post, the seat, the handlebar, the pedals, and the exercise meter. This shouldn’t take more than 30 minutes. Several tools necessary for the assembly are included. For maintenance, it is recommended to periodically lubricate the brake pad, especially if it makes a noise when in contact with the flywheel. For this, a few drops of silicone lubricant should do the trick. Other than this, it is recommended to periodically check the bike for loose or broken parts. The meter does not have backlight. The L-NOW D525 pooboo is an indoor cycling bike designed for home use. It’s equipped with a friction resistance system, a belt drive, a multi-grip handlebar, and a basic fitness meter. It offers 4-way adjustability for the seat and a pretty sturdy construction, being rated for a user weight capacity of 330 lbs. It’s a great bike for spin workouts, muscle toning, stamina and leg strength development, and weight loss.